« Real Energy and Cost Savings. Right Now. Here, in Texas. When the Clean Power Plan takes full effect, Latinos will be among the many Americans who will share in the benefits of a cleaner, healthier future that also affords us good jobs and energy savings. Let’s start with the question on everyone’s mind: Will the Clean Power Plan make my electric bill more expensive? According to analysis by the Environmental Protection Agency, the Clean Power Plan will reduce electric bills by about $7 per month by 2030. (It will also provide up to $54 billion dollars in public health and climate benefits.) Latinos are likely to feel these positive impacts directly because the benefits of clean energy, which replace polluting energy sources like coal, can reach us through health, environmental, and economic avenues – and sometimes all of these at once. Take solar power, for example. The price of solar has fallen 80 percent since 2008, and rooftop solar is now being deployed in middle class neighborhoods in places like Arizona and California where the median income ranges from $40,000 to $90,000. Technologies like solar keep our air clean and our kids healthy. This is key for the Latinos who work outdoors as roughly 1 in 4 workers in the construction and agriculture industries, and for the 14 percent of Latino children who have ever been diagnosed with asthma. Solar power can also save us money on our bills. This is especially true when they are coupled with incentives like net metering, which allows solar customers to receive a credit on their bill for sending excess energy they don’t use back to the grid. Solar power is also becoming increasingly accessible to all Americans. Thanks to new financing models like solar leasing programs (if you do not want to pay a large up-front cost) and community solar programs (if your rooftop is not suitable for solar panels or you rent your home), you don’t have to be rich to get in on the clean energy revolution. The Clean Power Plan will also help Latinos by creating tens of thousands of good, new jobs in the clean energy sector by 2040. This is part of a broader trend: In 2014, the solar industry added jobs nearly 20 times faster than the national average and is poised to add another 36,000 jobs in 2015. 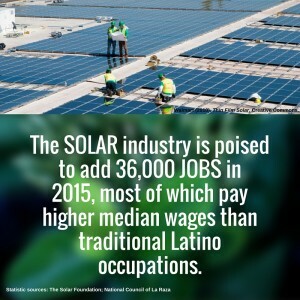 According to a 2013 report by National Council of La Raza, many of the jobs in this sector are highly accessible to Latinos, and Latinos are already engaging in the growing clean energy economy in locations across the country. In some places, like McAllen, Texas, Latinos are overrepresented in some of the top clean economy occupations; in others, like Albuquerque, New Mexico, Latinos could benefit from higher wages by transitioning to jobs in the clean economy. Most “green jobs” pay higher median wages than traditional Latino occupations, and this wage advantage holds true even outside of these traditional jobs. What about the most disadvantaged communities, those who are most in need of cost savings, cleaner energy, and protections from climate change? The Clean Power Plan aims to prioritize the deployment of energy efficiency improvements in low-income communities through the Clean Energy Incentive Program (CEIP). By providing a mechanism to award states extra compliance credit for efficiency programs that provide energy savings to low-income communities, the CEIP is designed to help lower electricity bills and bring jobs to people in these communities. A report by Environmental Defense Fund demonstrates that savings to families could be significantly greater with more widespread deployment of energy efficiency—securing a 15 percent improvement in energy efficiency by 2030 and generating annual average household savings of $157. Measures like the CEIP, along with strong stakeholder engagement requirements and other measures, will help ensure the Clean Power Plan benefits all Latinos – and all Americans – in transitioning to a clean energy economy. Claims that the Clean Power Plan will hurt Latinos, drive up energy bills, and disadvantage low-income communities are simply false. Rather, these are the very claims that spread harmful misinformation to our communities and create the most serious barriers to accessing clean air, affordable energy, and good paying jobs. At the same time, as with any ambitious challenge, our work is not done. States must finalize and deliver implementation plans to meet their pollution-reduction goals. This is where the rubber hits the road, and the states that get out of the gate quickly to achieve these goals will more swiftly capture the benefits. We must be engaged in this process, urging states to accelerate the transition to cleaner energy for all communities. First, we must tell our decision makers in Washington to support the Clean Power Plan. Then, Latino communities must demand a place at the table and advocate for states to act now – as should everyone who wants to ensure the benefits of America’s Clean Power Plan are shared by all. 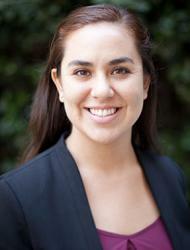 This entry was posted in Air Quality, Clean Power Plan, Energy Efficiency, Energy Financing, General, Renewable Energy and tagged Community Solar, green jobs, Latinos, Net metering. Bookmark the permalink. Both comments and trackbacks are currently closed.